Hollywood Boulevard was full of star power Thursday when "Star Wars" actor Harrison Ford and creator George Lucas helped present Mark Hamill with the 2,630th star on the Hollywood Walk of Fame. Screaming fans cheered almost throughout the ceremony at 6834 Hollywood Boulevard in front of the El Capitan Theatre. Some had lined up hours ahead of the event, which included two Stormtroopers who appeared to be guarding the star before it was unveiled in front of the historic theater. The 66-year-old Hamill, best known for his role as Luke Skywalker in Lucas' original "Star Wars" trilogy, "Star Wars: The Force Awakens" and "Star Wars: The Last Jedi," expressed his appreciation. "You are with me through thick and thin and the highs and the lows and everywhere in between," Hamill told the cheering crowd during his speech. "If it weren't for the public, I'd be nowhere. From Jedi to Joker and back again, it's been a fantastic ride. Thank you so much, and may the force be with each and every one of you." Fans lined up early to get a good view of Mark Hamill, Harrison Ford and George Lucas during Hamill's Walk of Fame star ceremony. Jonathan Gonzalez reports for the NBC4 News at 11 a.m. on Wednesday March 8, 2018. Hamill, a prolific voice-over artists who lends his voice to the villainous Joker in animated "Batman" and "Justice League" shows, punctuated his comments with a cackling Joker laugh. While accepting the honor, Hamill told the crowd, "Words truly fail me. It's hard to convey my gratitude, my joy, the exhilaration of being recognized this way." He joked, "I haven't been this speechless since 'Force Awakens,'" referencing the "Star Wars" sequel in which he briefly appeared but did not speak. Wednesday's event came 19 days before the latest entry in the franchise, "Star Wars: The Last Jedi," is released on digital and Blu-ray. Ford, whose star also is in the 6800 block of Hollywood Boulevard, joked with his co-star before sharing his thoughts on Hamill's life and career. "There were a lot more people at my star," Ford said. "Mark is a friend that I don't see very often. Our lives have diverged to a certain extent but I am very pleased for him. He has been the master of his own experience, his own life. And he is as he always was -- a quiet, sincere, honest person. He's not a grand-stander and I think he has found comfort and utility and control of his destiny, and I'm happy for you pal." 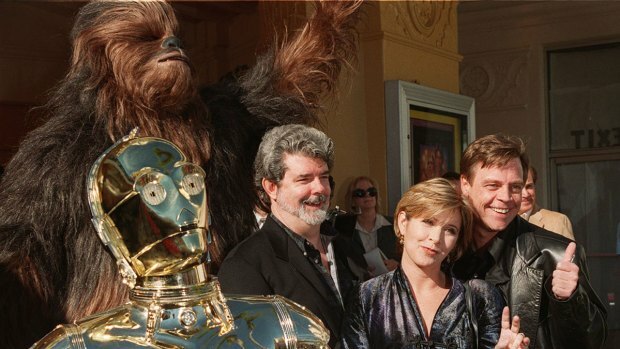 Hamill also hailed Lucas, noting if it "weren't for the genius of George Lucas, I wouldn't be standing here today." He also said he knew while working with Ford that he was in the "presence of greatness," and that Ford was "one of the best actors in film history." "He also gave me the great advice: 'Hey kid, don't get cocky.'" Hamill, born in Oakland, was a theatre arts major at Los Angeles City College, where he appeared in plays and musicals. He made guest appearances on several TV shows, including the daytime drama "General Hospital" and "The Texas Wheelers" before finding stardom. "Stars Wars," released in 1977, was Hamill's first feature film. Hamill also appeared in Samuel Fuller's "The Big Red One," "Slipstream," "Jay and Silent Bob Strike Back," and "Kingsman: The Secret Service." He also will be in the upcoming "Brisby Bear." He has starred in several Broadway productions and has a large catalog of voice-over work. Walk of Fame stars are awarded annually via a nomination submission process. The Walk of Fame Committee, part of the Hollywood Chamber of Commerce, then selects recipients from about 300 nominations per year. The process includes a $40,000 application fee, which is used for promotion, the star ceremony and maintenance of the star.